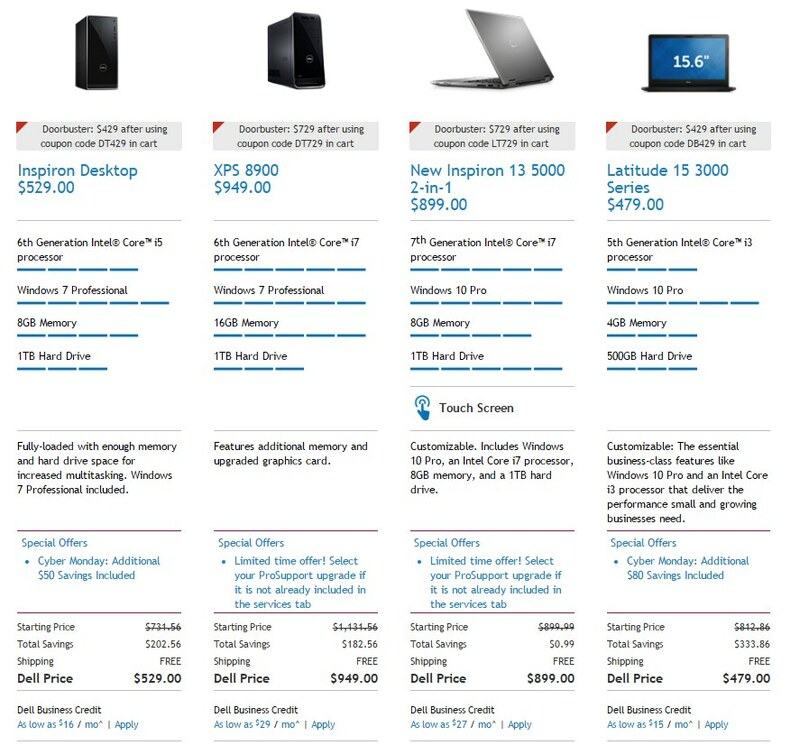 Here is the Dell Black Friday 2019 ad! 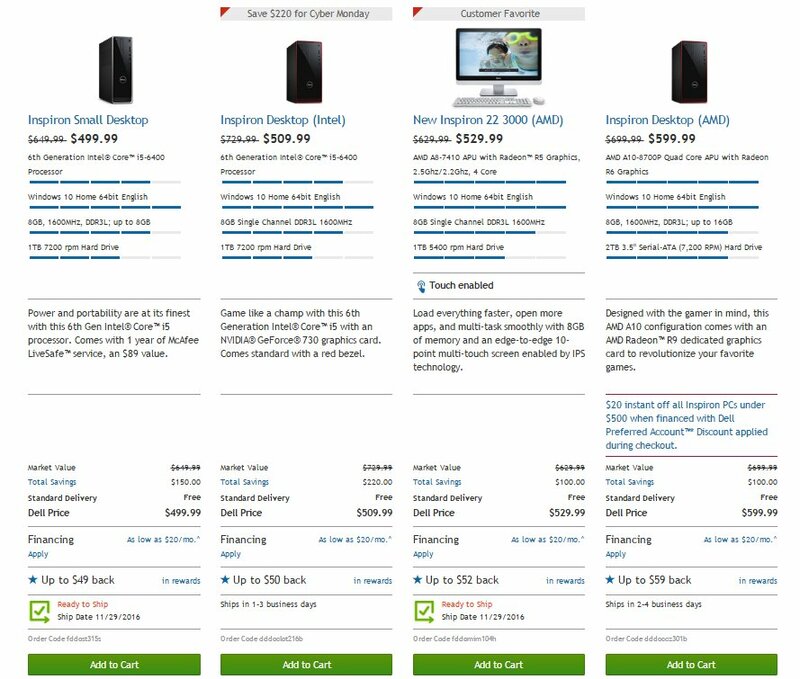 If you are looking for a laptop, desktop computer, computer monitor or television, then the Dell Black Friday and Cyber Monday sales are a good place to start. 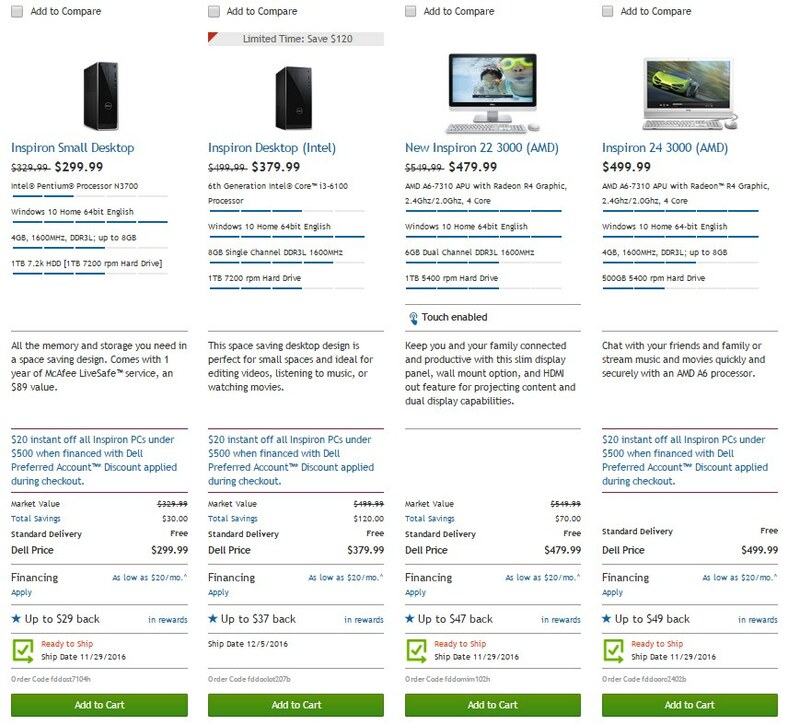 Last year, Dell offered its lowest prices of the year for Black Friday, with huge hourly doorbusters available online from 6 PM to midnight on Thanksgiving and then 8 AM to 8 PM on Friday. Thanksgiving evening doorbusters included a $99 Inspiron 11 3000, a $249 Xbox One bundle, and a $99 Inspiron Micro Desktop. 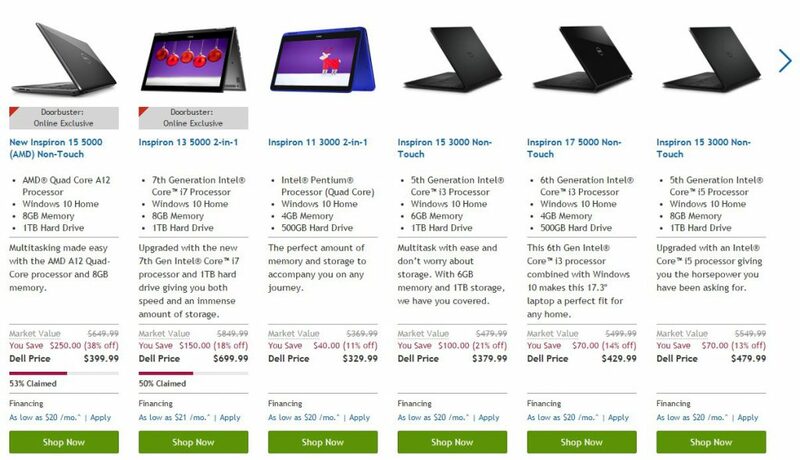 Some of the Black Friday doorbusters included an Inspiron 15 3000 Touch for $349.99, an Inspiron 15 5000 2-in-1 for $479.99, and an Inspiron 20 3000 All-in-One Desktop for $249.99. Television doorbusters included a 43″ LG 4K Ultra HD Smart TV for $299.99, a $499.99 Vizio 60″ Smart LED HDTV, and a $599 Samsung 55″ 4K Ultra HD Smart TV with a bonus $150 Dell Promo eGift Card. 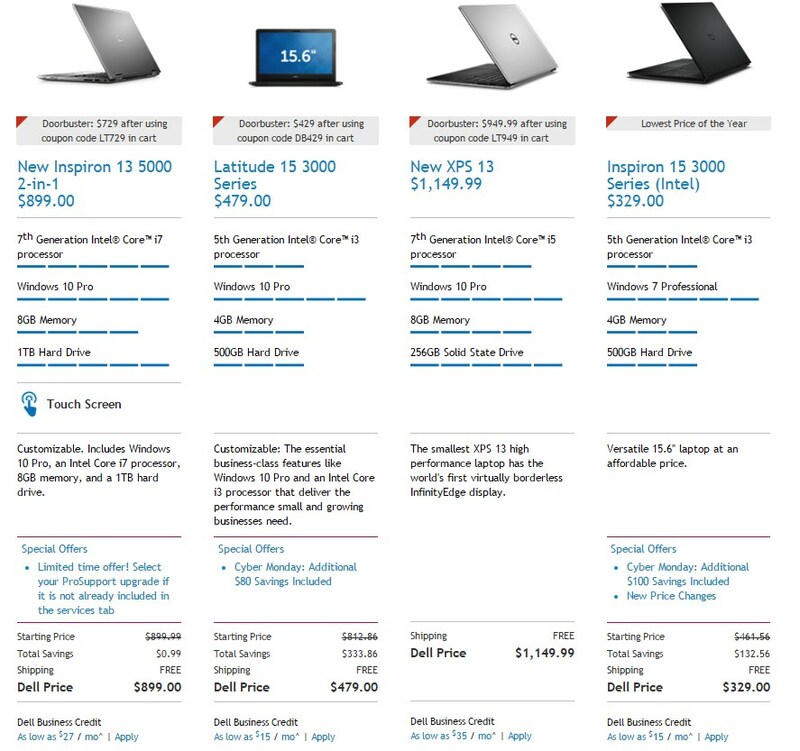 We took a few screenshots of the deals and discounts on the Dell website for the Monday after Thanksgiving last year. We will post the savings available from Cyber Monday 2019 when they are available in late November. Dell is a multinational computer technology company based in Texas that sells personal computers, servers, printers and other electronics including. The company was named after its founder, Michael Dell. It was the third largest PC vendor in the world in the first quarter of 2017, behind Lenovo and HP.